The old AYA clacked shut with two yellow shells in the receiver as my dog whined in the cab of my truck just before first shooting light. The morning cast its grey shade over the fields, soon to be tinged with dawn’s red. "That dog and hunting saved a young kid from the pitfalls of a small town where boredom creeps in every weekend like the fog." I opened the door of my truck and she bounded out with all the enthusiasm of a two year old. She ran to the edge of the parking area, pranced back jumped up against me, came back down then bit my cuff and gave it a tug. I would be willing to bet that few people would recognize my springer as a twelve year old. I wave her out into the grass and follow as she quartered into the field. So far so good. I was still very nervous as it had been years since we had gone hunting together... heck it had been years since I had gone hunting at all. Decoy, my springer, hadn’t forgotten anything in the six years that I had been away. It was almost as if I was a kid again hunting pheasants behind her. She hadn’t lost a step. Decoy ran over, around and through cover never skipping a beat, making me horribly regret not finding the time to hunt with my best girl after I moved out. Moving out and away from home, getting married and finally getting a home of your own makes a fellow a lot busier than he should be. I didn’t think it right to leave Decoy alone at whatever dive I was living in at the time while I was busy at work. So she stayed with my parents on the farm and got to chase ducks to her hearts content and go fishing with my brother. When I would come home to visit, Decoy would light up and grab my shirt sleeve when she saw me. I would always try to take her back to the beaver ponds behind my parent’s property so we could flush up the local mallards and wood ducks. When it came time for me to leave again and go back to my new life, she would break my heart by running to my car and sitting by the door, stamping her feet and whining as if we were going hunting. I would ruff up that fluffy liver and white head and tell her we’d be back at it soon. As those years went by, time began to catch up with my dog and I - as it will always do. I wasn’t getting any less busy and my dog was beginning to get old. Grey started creeping into her muzzle and eyebrows. She started to lose her hearing, although she learned hand signals exceptionally well, no doubt in thanks to her early waterfowl work. Never the less I started to get scared, we all know that time takes every thing away sooner or later, we just don’t like to think about it. I got caught thinking about it and my heart shattered. What was I going to do? This dog was the totem of my youth! Growing up in a non-hunting family I had no one to hunt with, let alone any one that could teach me how to do it. My mother had enough sense to finally give in and let me get a bonafide bird dog. Every hour of my day, while not at school, was devoted to that dog. She is the one who took me hunting, for I merely followed her all day. Decoy showed me what hunting was about and how to do it, not the other way around. In turn, I loved hunting even more. For a long time it defined me. And what would I be without that little liver and white springer, where would I be and who would I be? That dog and hunting saved a young kid from the pitfalls of a small town where boredom creeps in every weekend like the fog. 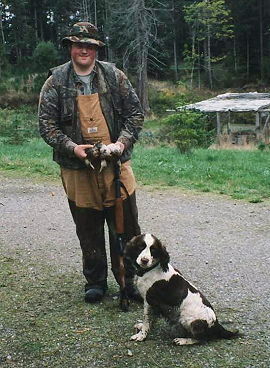 Many of my friends started experimenting with drugs and alcohol, changing the course of their lives forever, but I had my little white and liver spaniel and we had hunting and fishing; and that left no time to even consider that there was room for any other addiction. I cant possibly comprehend what my life now would be like if that dog had never entered it so many years ago. I learned the sense of pride that one has for the dog that they know inside and out, other people could see it as well. My dog and I became minor celebrities in that town’s hunting circles. We would more often than not get our limit of pheasants, Decoy would always find that one lost cripple duck that some one had shot and their own dog could not find. I had something to be proud of and something tangible to believe in. My world for those carefree days of my youth was my springer spaniel. My Decoy. That means a lot for a lonely teenager, who didn’t necessarily fit in with any clique. It didn’t matter, I had my dog and for that, I would always be grateful. "When she chased that big rooster out of the blackberry tangle everything felt right with the universe, my shoulders had that extra light "I'm a kid again, homework be damned" feeling to them." Late in the summer, Decoy came home with me. To be honest, I didn’t think she would be up to hunting anymore. I thought, at best, she would hunt for a half hour or so and be too tired to go on. I thought that her lack of hearing would get her lost or in trouble, heck I thought she wouldn’t remember anything about hunting at all. To agree with my wife, I think too damn much anyway. After all, I didn’t teach her a darn thing about hunting. Being the only hunter in the entire family, she taught me. She did every thing she was supposed to. Honestly, it felt like I was fifteen again, even my old pawnshop side by side was there for the occasion. We were hunting for the first time... again. When she chased that big rooster out of the blackberry tangle everything felt right with the universe, my shoulders had that extra light "I'm a kid again, homework be damned" feeling to them. Bills, work, and other "grown up" worries were vanquished that day. He rose to the sky cackling pheasant curses at us; I raised the gun to my cheek, caught up to him and swung the barrels through his tail and body passing his head and famous ringed neck. I missed the bird clean with both barrels. I guess everything can’t be perfect, can it? Decoy chased him a little and barked, as she always did with the first miss of the year. Then she ran up to me and spit one of the spent wads at me feet, while barking in pure frustration! I can only imagine how badly she wanted to retrieve that bird; she always understood that was what the whole catastrophe was all about. She hunts; I shoot. She retrieves and gets a "good girl!" or I miss and I get yelled at by a cranky spaniel, who only barks when I mess up. Somehow I would like to think she is offering shooting advice. But the tone tells me otherwise. And she knows as much about shooting as I know what a pheasant smells like. Decoy snorted and started hunting again. Yep, just like old times indeed! I wish I could say that I limited out with her on that first day, but the one we got was a trophy and a half. She flushed him, and the bird flew straight up and out of an oak thicket. It towered above me and rocketed out over the field. Somehow I made that shot, although it felt as if the gun was pointing at the clouds overhead. And somehow Decoy got out of the thicket in time to see the bird land 90 yards away. She zipped across the stubble and made a perfect retrieve. I let her hang on to the rooster for a little bit before putting it in my game bag. After almost three hours of hunting I felt beat, my old girl wasn’t even panting, but I figured to end the day on a high note and go get some lunch. After six years, three missed birds and one bagged rooster we were hunters again... and I felt like a carefree teenager once more. I got to experience the most important part of my childhood brought into the present. If ever there was a time machine this was it. That was the start to one of the most memorable hunting seasons I ever had, after all there are not many people who can say they got a second chance to hunt with their first gundog.